It felt ridiculous to be pulling out the chickweed that was threatening to strangle my husband’s potato plants, my husband’s precious potato plants because the only nationality that loves potatoes more than Germans are the Irish. I had recently read a post about chickweed being grossly underrated and being a true super food. The story was accompanied with a recipe for pesto, of all things, made with the chickweed green, as opposed to basil. We grow basil- about a dozen plants, which we struggle to keep insect free all summer long as our family eats a large amount of pesto. I longed to try the chickweed recipe. Just now was not the time as I was preparing for a long trip to India. Perhaps I should be harvesting it as I ripped it out and throw in the freezer for the winter. It seemed like such an ignorant waste. Why is this plant a nuisance but basil is coveted and nurtured in the garden? I shared my conflicting feelings with Todd as I yanked and tossed the chickweed into a pile left to rot and he said, “Well we could plant nothing and just eat chickweed.” He clearly has no affection for chickweed. I already knew you could eat chickweed. Years ago, I taught myself how to identify wild edibles before I went on the Appalachian Trail as a thru-hiker. I figured the knowledge might come in handy and it did. I supplemented my dinner meals with wild greens to stretch and fortify my trail meals. I found the tender greens on the edges of power lines and in the fields and meadows along the trail. After the trail, I even shared my knowledge and gave workshops on the topic at hiking conferences and nature centers. And then I got married and my groom and I tended to a cultivated garden, growing spinach and lettuce and kale and greens like that and I forgot about wild edibles. Until I had children and I wanted to pass that knowledge on. Shortly after young Bryce learned that chickweed was edible, he pretended he was a goat and doused “the weed” in the garden with balsamic salad dressing and got on all fours and ate it like a goat, just for fun. 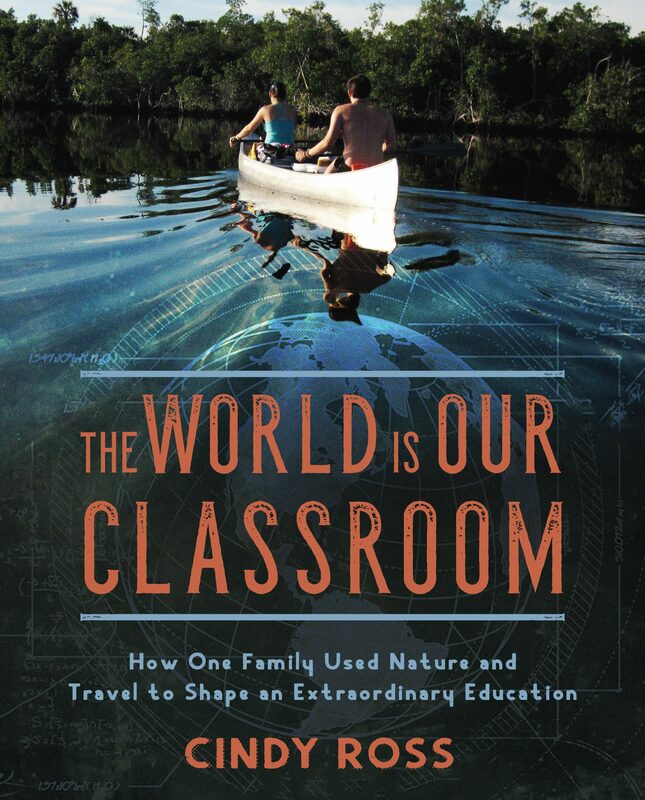 That story is in my new book, “The World is Our Classroom- How One Family Used Nature and Travel to Shape an Extraordinary Education,” Skyhorse Publishing, NYC in the chapter on Learning at Home in the backyard. And then I forgot about wild edibles again. Except for dandelion. I never forgot about dandelion as it saved me one year. After I delivered Bryce, my body had a hard time getting rid of cholesterol and it built up uncharacteristically and created gall stones, which I passed with tremendous pain. My nurse and nutritionist friend Lila, advised me to cut out fat and strengthen and tone my gall bladder and related organs by taking dandelion tincture which is a great purifier. I cured myself and never had another bout with gall stones. Dandelion won my heart 26 years ago, but chickweed was slow to take a hold. Dandelion is one of the first greens to resurrect in the spring. I drench it with a delicious hot vinegar, sugar and coddled egg dressing similar to what the Pennsylvania Germans put on lettuce and call “hot bacon dressing,” only without the bacon. It is best eaten before the leaves get long and tough and bitter and produce the golden flowers. I have a few friends that eat dandelion salad in the spring but they buy the greens at market and don’t dig them themselves, which is extremely satisfying. It feels like free food, which wild edibles are, gifts from the earth. We were Easter egg hunting at my sister-in-law’s this past Easter down in York County. Her sons hide eggs for the adults in the family as there are only two children and a whole more adults, so they switch it up. While I was running about, I noticed young dandelion plants. Since York County is about 2 hours south of our home and about a week earlier in the season, I knew I could get a good salad in early before our dandelion pushed up from the soil. After the egg hunt, I asked for a digging tool to harvest them and take the plants home. My nephew Austin was fascinated. (You can’t harvest dandelion from a yard that is treated with pesticides however.) Austin harvested his own a few weeks after Easter but it was too late in the season and they had flowered and turned bitter, but a seed might have been planted. As a rule, we don’t teach our children wild edible identification and why not? It seems like a useful bank of knowledge to have. It just requires a different mindset. Seeing wild greens as super foods, instead of lowly weeds sounds a lot more stylish and trendy. I wondered myself if dinner guests would turn their noses up if I served them a salad of young plantain, dandelion, chickweed, sheep’s sorrel? I was walking the other day and discovered a tremendous crop of watercress growing in a clear pure pond. The house is not lived in so when I did see the owners, I asked if I could trim some and they said yes. They are elderly folks and he knew about edible watercress but never harvests it when he goes to his second property to care for the lawn. And why not? We have gotten so far away from our roots- as settlers and native people who understood, valued, and celebrated wild edibles by eating them on a regular basis. They are so incredibly nutritious and if eaten minutes after they are harvested, they cannot compare to buying even organic greens in a store that have traveled miles and sat for days. Last night, Todd asked me to thin out the red beets and the spinach. I snipped off the roots and threw them into our salad that night, along with some chickweed. Why do we work so hard to produce food when the earth gives it to us as a gift? I like my olive-oil stir fried kale and I don’t mind tending to my garden, but I am going to incorporate wild edibles into our diet again. And I may just get down on all fours and eat like a goat when no one is looking, to up the childlike, fun factor in my life too! 4 handfuls of fresh chickweed. 2-3 tablespoons of lemon juice. YUM ! Thanks yet again Cindy.